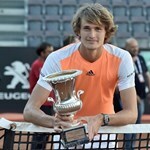 Twenty-year-old German Alexander Zverev won the first Masters 1000 tournament of his career by defeating Serbian Novak Djokovic 6-4 6-3 in 1 hour and 20 minutes in the final of the Italian Open. Zverev, ranked 17th in the world, had already won three ATP titles (in St. Petersburg in 2016 and this year in Montpellier and Munich), but despite those victories, he had never won a Masters 1000 event, the tournament category just below the Grand Slam tournaments. The Serbian, who had never lost a major final to anyone other than Nadal, Federer or Murray, reached the final after defeating Argentina’s Juan Martín Del Potro (6-1, 6-4) in the quarterfinals and then Austrian Dominic Thiem (6-1, 6-0) in the semifinals. Djokovic had won four trophies in Rome, but this time the Serbian was inaccurate against an opponent that was oblivious to pressure. “Nole” committed nearly twice as many unforced errors as Zverev – 27 to 14- and failed to find the formula to solve Zverev’s challenges. The German displayed a great level of tennis, maturity and patience rarely seen in players of such age. He showed a great tennis repertoire that surprised both the Roman public and his rival. With a cool head and a display of great tennis the German always looked very confident. He was very aggressive and used a splendid serve that propelled him to his first set victory. In the second set, Novak Djokovic tried everything, but despite his efforts the Serbian failed to break Zverev’s serve even once. Zverev sealed the match with a 6-4 victory in the second set. With this victory, the German aims for bigger things and definitively announces himself as a threat to have a deep run at Roland Garros in Paris. Due to his great performance in Rome on Monday the German entered the top 10 of the ATP ranking at number 10. Undoubtedly, along with Thiem; Zverev is among today’s young stars that are called to one day dominate the future of tennis and replace players like Nadal, Djokovic, Murray and Federer.